This program provides learners with the skillset needed to ensure a consistent service quality across channels that is in line with company objectives. 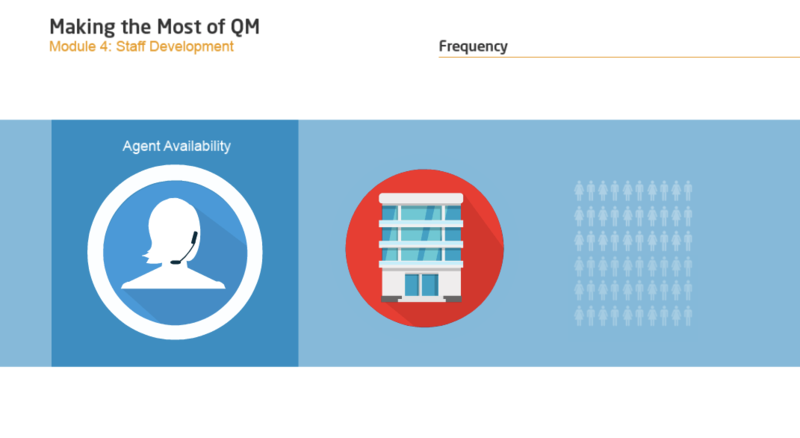 It covers essential tools, techniques, and aspects of the QA process; the quality monitoring form, calibration meetings, coaching, voice of the customer programs, quality monitoring programs, and interaction analytics. This program is designed to equip you with the fundamental knowledge on how to conduct quality assurance professionally. A good quality monitoring form will help you identify what your contact center is doing well, and what needs to change, in order to retain your current customers and attract new ones. This course teaches how to create a new quality monitoring form, how to fine-tune an existing form, and helps you decide how often you should revisit it in order to get the most from you quality monitoring program. 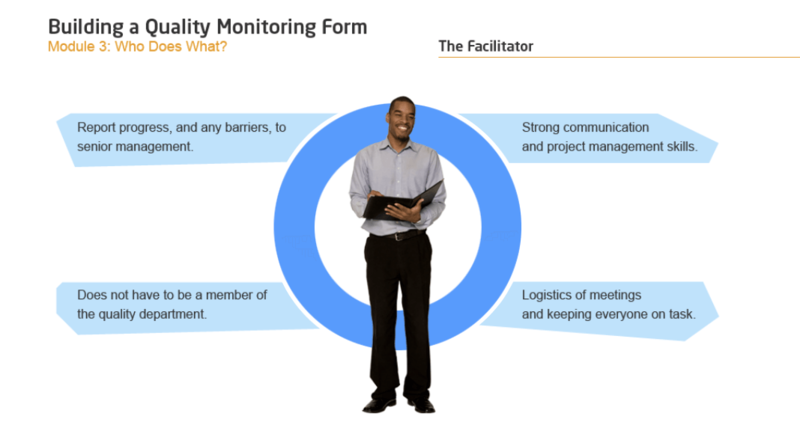 This course starts with how to identify your stakeholders’ needs and then shows you how to build your quality monitoring form to ensure those needs are satisfied. Next, you’ll learn who should be on the project team and how to build a quality standard definition document that leaves no room for interpretation and is based on objective behaviors. Then the structure of the form is discussed; how does each section relate to the call, email or chat that is being assessed and how should each section be weighted. Finally, to prepare for the roll-out of your form, this course discusses how to run a pilot program. This course is packed with with practical exercises and essential information that will help you gain the skills you need to build an effective quality monitoring form. Create and fine-tune your quality-monitoring form. Build a logical, easy to follow quality standards definition document. Determine scoring ratios for each part of the form. Examine the pros and cons of applying penalties to key sections. Run a pilot program to ensure the form is ready to use in the contact center. Describe how to build the Quality Standards Definition Document. In this module, we’ll test your knowledge of the key learning points from the course. To score a passing percentage of 80%, you must answer 16 of 20 questions correctly. One of the biggest challenges in quality assurance is the perceived fairness of the process. Regardless of how well crafted your quality monitoring form is, there will always be room for interpretation which can trigger a feeling of unfairness. By regularly calibrating the scoring process, you can identify differences in interpretation, and resolve them through effective group discussion. 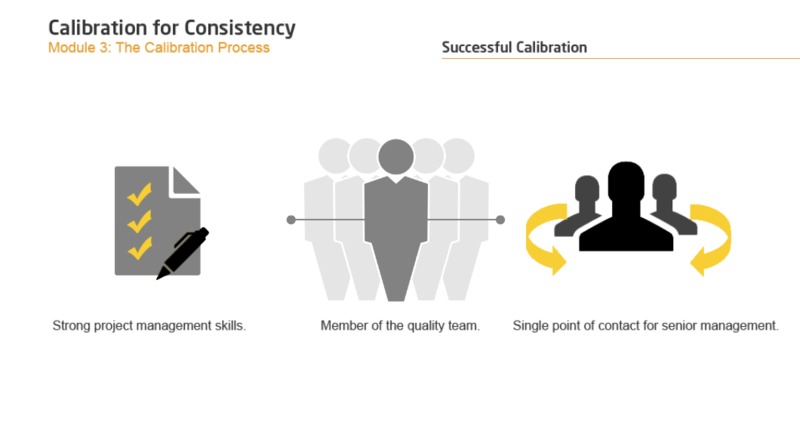 Calibration is the activity of standardizing scoring through group discussion with the goal of making sure that any two analysts score the same conversation in the same way. This course describes the benefits of calibration and how to get buy-in for an ongoing calibration process. It explains how to prepare for the calibration meetings, who to pick as the owner for the calibration meeting, what ground rules for effective collaboration should be applied, and how often the calibration meeting should take place. Finally, methods for measuring the effectiveness of calibration are presented. This course contains an interactive assignment where you will assess a call and practice some of the techniques to reach a consensus on the final score. Run a productive calibration meeting. Explain to others why calibration is key to the success of the contact center. Determine how often to calibrate. Measure the effectiveness of the calibration process. Identify ground rules for promoting effective communication. Provide constructive feedback in a group setting. Outline the three key ingredients to successful calibration. Most contact centers are in a constant state of change; hiring new staff, changing processes, or releasing new products or services. If these changes aren’t carefully supported by effective coaching, service can quickly become inconsistent. Effective coaching, therefore, is an essential component in maintaining and improving the quality of service you provide to your customers. Effective coaching can help agents identify what they’re doing well, what they need to change, and how to make that change. It improves the productivity and quality of work, reduces agents’ stress levels, and boosts agents’ confidence and job satisfaction. This course is designed to help you get the most out of your coaching process. 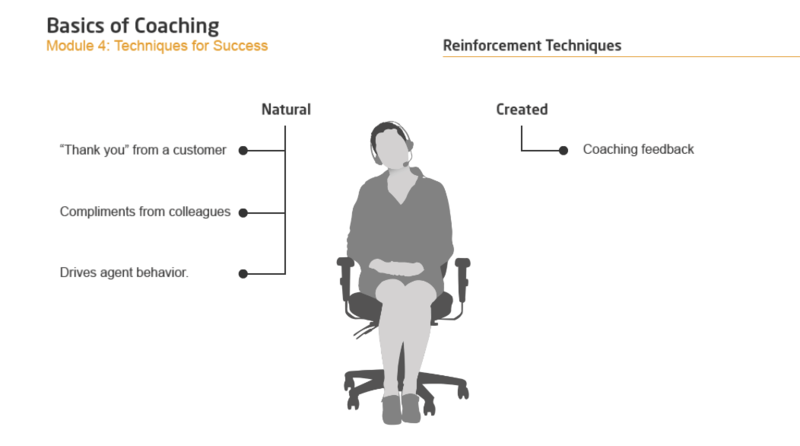 It outlines the steps for assessing call center performance, covers how to prepare for coaching sessions, and teaches the conversational questioning technique. Best practices for listening and specific coaching techniques for celebrating, clarifying and correcting are also presented. To reinforce the learning process, this course contains interactive assignments where the presented coaching techniques can be practiced. Apply the conversational questioning technique. Apply coaching techniques to either celebrate, clarify or correct agent behavior. One of the greatest challenges for any business is to understand their customers’ needs, and determine how well they’re meeting them. A Voice of the Customer (VOC) program allows you to gather and analyze your customers’ perception of your company. It focuses on what your customers expect from the product or service, what they like, and what they don’t like about the offering. This course teaches how to set up an effective VOC program. 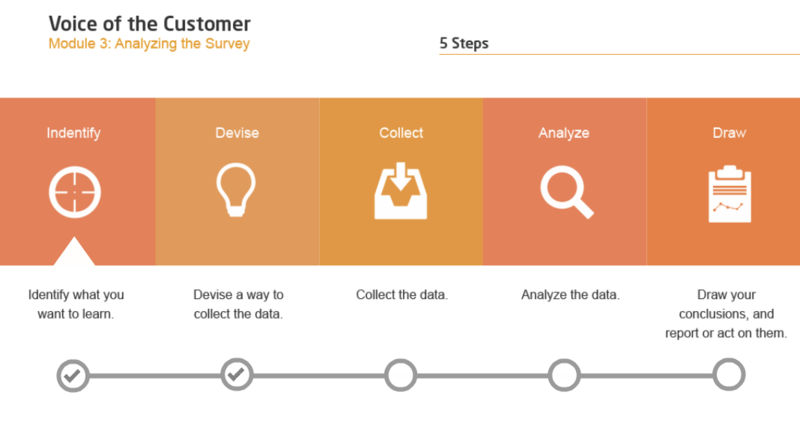 It covers the topic of customer surveys; how to construct the survey and how to analyze the results of the survey. It presents methods for capturing customer feedback from contacts with your agents. And the course includes a 10-step process to ensure that you’re communicating with customers effectively. Set up a successful VOC program. Build an effective VOC survey. Distribute and analyze a VOC survey. Apply the ten-step process to assess your current communication strategy. Capture compliments, competitor information, advertising feedback, and customer desires to enhance your VOC program. An effective quality monitoring program is an indispensable asset to your contact center. It can accurately measure the quality of service, track adherence to processes and procedures, identify opportunities for employee development and even boost morale. This course focuses on how to lift your quality monitoring program to the next level. It provides best practices for your quality monitoring program and shares common mistakes you’ll want to avoid. Ideas are presented on how to ensure employees welcome the monitoring process. Methods for staff development are shared and you’ll learn how often specific agents need to be coached. Finally, you will learn how quality monitoring can contribute to the voice of the customer program. Avoid the most common mistakes in implementing a quality monitoring program. List the four goals of an effective monitoring program. Develop a call recording strategy for gathering sample interactions. Ensure consistency and fairness in the monitoring process. Leverage quality monitoring to drive performance improvement in the contact center. A well-designed interaction analytics program can drive significant improvements in agent productivity, and the effectiveness of your quality program overall. It will help you learn what to do more from your successes and what to avoid from your failures. What’s more, interaction analytics can help you focus your coaching efforts to where they are required the most. This course covers the different types of interaction analytics, how to use an analytics package, and will prepare you for the challenges when implementing an interaction analytics program. Convey the benefits that interaction analytics can bring to your contact center to others. 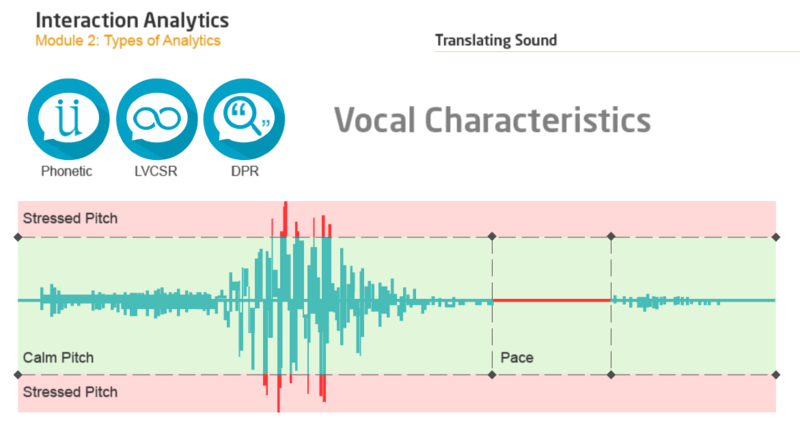 Transform agent performance through contact, screen, and speech analytics. Analyze customer communications to discover service hiccups early. Understand three powerful interaction analysis techniques. Get the most from a well-structured analytics package. Deal with the challenges of designing an effective analytics program. We offer bulk discounts for orders containing 5 or more seats for a program or bundle. Check our pricing options for Quality Assurance below. If you apply for bulk pricing, please contact us to place your order. Provide your supervisors with the necessary knowledge and skills to lead their teams and the contact center to success. The Quality Assurance program is designed by call center experts to provide a practical and engaging learning experience. Start today.